The first boxing promotion of Lamon Brewster’s Relentless Events was a resounding success, featuring a night full of devastating knockouts and musical performances from acclaimed artists Yung Joc and Keri Hilson. Not to mention “The Return” of the former WBO heavyweight champion Brewster himself. The card took place in Cincinnati, Ohio’s Cincinnati Gardens and drew a near capacity crowd. The event was promoted in association with Colin Bates’ C’Believe and Andrew Williams’ R&R Promotions. 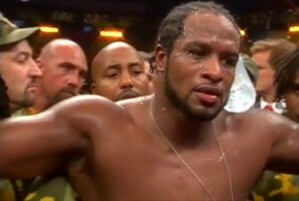 In the main event, Lamon Brewster returned to his winning ways with a vicious fifth round knockout of Danny Batchelder. Brewster, now 34-4 (30 KO), had been inactive for over a year as he healed from a nagging shoulder injury. Feeling healthy and revitalized, Brewster started at a slow pace as Batchelder used his jab to keep the distance. As the rounds progressed Brewster gradually began to close the gap and take the fight to Batchelder. A right hand from Brewster over a lazy Batchelder jab dropped him hard and disabled Batchelder temporarily for the ten count..
Brewster picks up the coveted NABA heavyweight title and reasserts himself back into the heavyweight championship picture with the victory. He becomes the fastest fighter to knock Batchelder out, eclipsing undefeated heavyweight Alexander Dimitrenko by two rounds. Brewster says he is working on finalizing a deal to stage the second Relentless Events promotion on November 11 in his hometown of Indianapolis, Indiana at the Canseco Fieldhouse which can hold a maximum of 18,000 people. When Aaron Pryor Jr’s original opponent Sammy Sparkman pulled out at the weigh-in it appeared that his hometown debut would have to wait. What came out of the tragedy was a more compelling matchup when 2000 Olympian and fellow Cincinnati-native Dante Craig agreed to step in for Sparkman. Some felt that Craig would be too big of a step-up for the upstart Pryor, the son of legendary junior-welterweight champion Aaron Pryor Sr. Pryor silenced all of his critics with the 3 round blitzing of Craig. Although both weighed in as middleweights, the 6’4 Pryor Jr’s height advantage over the 6’0 Craig became a huge factor as his long jab kept the shorter knockout artist on the end of his 1-2 combinations. In the second round Pryor began to hurt Craig with his right hand bombs that couldn’t miss. The round was easily a 10-8 frame for Pryor. The onslaught continued into the third round prompting the ref to call a halt to the bout midway through the stanza. Pryor Jr. raised his unbeaten mark to 11-0 (8 KO) while Craig drops to 17-8-1 (13 KO). Rashad Holloway wanted to make a statement in his second appearance as a professional in his native Cincinnati. Using Junior Ramos as his canvas, Holloway painted a four-round masterpiece before the referee reached the count of ten. Holloway raises his record to 9-1 (5 KO), while Ramos, a native of the Dominican Republic fighting in America for the first time, drops to 8-4 (3 KO). Holloway scored four knockdowns, 1 in the first, two in the second and one more for the count at 2:35 of the fourth. The coup de grace was a right hand to the temple that completely anesthetized Ramos. Holloway, 27, honed his skills through sparring with elite fighters like Antonio Margarito, Shane Mosley and Sergio Mora. As an amateur Holloway won a total of seven Golden Gloves in Ohio and North Carolina. Domonique Dolton, an 18-year-old KRONK Gym product from Detroit, Michigan, made very short work of David Foster, scoring an easy first round TKO. Foster was down twice before the referee waved the fight off. Dolton, who entered the card on only two days notice, raises his record to 2-0 (2 KO). Foster drops to 4-22-2 (3 KO). Pro debuts Hasaan Murph and Quincy Johnson fought to a highly competitive majority draw. Murph, who was a highly decorated amateur out of Cincinnati, was determined to assert his greater speed and technique over Johnson, who was determined to make a brawl out of the affair. In the end, the judges couldn’t decide on a clear winner. Both men begin their pro careers with a record of 0-0-1. It didn’t take long for Brandon Bennett to solve the unorthodox style he had in front of him with Izale Kimble. Bennett, a southpaw from Cincinnati, used his strong punching power to defuse the wild movement of Kimble. At 1:29 of the second Kimble’s corner threw in the towel. Bennett’s record rises to 2-0 (2 KO) while Kimble drops to 0-1. Adrien Broner expended more energy celebrating than he did fighting. Broner came at his opponent David Warren Huffman winging vicious body punches without throwing a single significant blow upstairs. After 1:20 Huffman decided he no longer wanted to fight, turned his back and quit. Broner said he wants to move up to 6-round fights in his next assignment. Broner moves to 2-0 (2 KO) while Huffman drops to 0-2. Local favorite David Long was on the wrong side of an upset win when Mike Miller’s right hand connected to his jaw that dropped him in the first round. Long beat the 8 count but the referee used his discretion to halt the bout at 2:31. Mike Miller raises his record to 5-12-2 (3 KO) while David Long loses for the first time at 6-1 (3 KO).